Concrete dams are built in four basic shapes. The concrete gravity dam has weight as its strength. 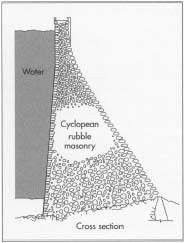 A cross section of this dam looks like a triangle, and the wide base is about three-fourths of the height of the dam. Water in the reservoir upstream of the dam pushes horizontally against the dam, and the weight of the gravity dam pushes downward to counteract the water pressure. The concrete buttress dam also uses its weight to resist the water force. However, it is narrower and has buttresses at the base or toe of the dam on the downstream side. These buttresses may be narrow walls extending out from the face of the dam, much like the "flying buttresses" supporting cathedral walls or a single buttress rather like a short dam may be built along the width of the toe of the dam. The arch dam is one of the most elegant of civil engineering structures. In cross section, the dam is narrow in width, but, when viewed from above, it is curved so the arch faces the water and the bowl of the curve looks downstream. This design uses the properties of concrete as its strength. Concrete is not strong in tension (when it is pulled or stretched), but it is very strong in compression (when it is pushed or weighed down). The arch dam uses the weight of the water behind it to push against the concrete and close any joints; the force of the water is part of the design of the dam. The arch-gravity dam is a combination of the arch type and gravity type, as the name suggests; it is a wider arch shape. Multiple-arch dams combine the technology of arch and buttress designs with a number of single arches supported by buttresses. Concrete dams are used more often than fill dams to produce hydroelectric power because gates (also called sluices) or other kinds of outlet structures can be built into the concrete to allow for water to be released from the reservoir in a controlled manner. When water for power, drinking water, or irrigation is needed downstream, the gates can be opened to release the amount needed over a specified time. Water can be kept flowing in the river downstream so fish and other wildlife can survive. Both concrete and fill dams are required to have emergency spillways so that flood waters can be safely released downstream before the water flows over the top or crest of the dam and potentially erodes it. Spillways channel the water downstream and well below the base or toe of the dam so the dam and its foundation are not eroded. Most dams built in the twentieth century and those being designed today have several purposes. Over 40,000 dams higher than 45 ft (15 m) and classified as large dams exist, and more than half of these have been built since 1960. Of these dams, 16% of them are in the United States and 52% are in China; 83% are fill dams used primarily for water storage, and the remaining 17% are concrete or masonry dams with multiple purposes. Dams that generate hydroelectric power produce 20% of the electricity in the world. Fill dams may be a far older construction technique than concrete or masonry dams, but the oldest surviving dam is Sadd el Kafara about 20 mi (32 km) south of Cairo, Egypt. This dam is actually a composite consisting of two masonry walls with the space between filled with gravel; it was built between 2,950 and 2,750 B.C. The ancient Romans developed superior techniques for building with masonry, but, curiously, they did not often use their masonry skills in dam construction. An exception was the Proserpina Dam in Merida, Spain, that is still standing today. Developments by the Romans were not overlooked by others. In about 550 A.D. , the Byzantines on the eastern fringes of the Roman Empire used the shape of the Roman masonry arch to build what history believes was the world's first arch-gravity dam. Dam building came to America with the conquistadors. In Mexico, they saw dry land in need of irrigation and imitated the dams built by the Romans, Muslims, and Spanish Christians in their homeland; the Catholic Church financed construction, and many of the missionaries were skilled engineers. Dam building was rare in Europe until the Industrial Revolution. The northern climates produced more rainfall, so water power was naturally occurring and water supply was plentiful. In the eighteenth century, however, the rise of industry necessitated constant, reliable supplies of water power delivered at greater force, so masonry and concrete dam construction became popular in Europe. The Industrial Revolution also powered developments in science and engineering, and the civil engineering specialty, which includes designing and building structures to better the quality of life, came into existence in the 1850s. Early civil engineers began to study Sir Isaac Newton's physics and other scientific theories and apply them to practical structures including dams. Reminants of the Austin, Pennsylvania, dam after its failure on September 30, 1911. On September 30, 1911, the town of Austin (population 3,200) in the mountainous country of north central Pennsylvania was ravaged by a torrent of water roaring through the valley, channeled by its narrowness and rugged walls. The force ripped gas mains from beneath the streets; and as soon as the wall of water passed, an errant flame lit the gas and the fire jumped from gas pipe to gas pipe and house to building throughout the standing remains of the 30-year-old town of Austin. Initial reports claimed that 1,000 people had perished, although later information placed the death toll at between 50 and 149. The source of this grief was also the source of livelihood for Austin. The Bayless Pulp and Paper Mill owned the concrete dam, which it had constructed in 1909 to provide a water storage reservoir for its water-intensive pulp- and papermaking business. There had been a precursor to this disaster in January 1910 when, following intense winter rain and snowmelt, cracks had been observed in the dam. The cracks were repaired, but they were not recognized as indications of problems related to the foundation, design, and construction of the structure. The dam was still under construction as the winter of 1909-10 approached. Temperatures were below freezing when some of the concrete was placed, and the final stages of construction were finished hurriedly. The dam was completed on about December 1, 1909, and a crack running from the crest of the dam vertically to the ground was visible when construction was finished. By the end of the month, a second crack had appeared. Both cracks seemed to have resulted from contraction of the concrete. On January 17, 1910, a warm spell brought heavy rains and caused rapid snowmelt, and four days later, flood water was pouring over the spillway. All technical aspects of Austin Dam were poor. The construction failures were obvious and included use of weak, oversized aggregate placed in improperly cured concrete in freezing weather. When the January 1910 failure occurred, it showed that the dam structure and the founding bedrock had failed. The owner/operator's disregard of the engineer's recommend-ed repairs was the fatal seal. The key raw materials for concrete dams are concrete itself and steel reinforcement. number of other materials and components made by specialty contractors may be used in dam building and include steel gates and tunnel liners, rubber waterstops, plastic joint-filling compounds to prohibit the movement of water, electrical controls and wiring, siphons, valves, power generators, a wide assortment of instruments, and even Teflon sheeting to line water outlet structures to prevent turbulence and cavitation (damage due to swirling water). Concrete itself is made of cement, water, and materials collectively called aggregate that consist of sand or gravel. Cement has unique properties that must be considered in selecting the cement, designing the dam, and timing construction. Mixing of cement and water causes a chemical reaction that makes concrete hard but that also releases heat. This causes a distinct rise in the temperature inside a mass of concrete, and, when the concrete begins to cool, it shrinks and cracks, potentially causing leaks. To limit these effects, concrete can be placed when the air temperature is low, low-heat cement can be used, and water can be circulated through pipes in the concrete. Furthermore, the concrete has to be placed in shallow lifts (i.e., only a few feet or meters are added at a time) and in narrow blocks; then it has to be allowed to cure over a specified minimum time so the heat dissipates. Depending on the design of the dam, engineers will choose the concrete mix (including the cement and type of aggregate) very carefully; a thin arch dam is designed with a different concrete mix than a massive gravity dam. Design of a concrete dam depends on the purpose of the dam and the configuration of the site where it will be built. Dams are of two general types. Overflow dams block flow in a stream and harness the water for generating power or to improve navigation and provide irrigation water. The components of an overflow dam are designed so the water can be released and the level of the water in the reservoir regulated by a series of sluice gates, spillways, or outlet tunnels. Non-overflow dams store water for drinking water supply, irrigation, or power; they also have a spillway, but its use is restricted for emergencies to lower the water level quickly during floods. Methods for releasing the stored water are much more limited than in overflow dams, and the dam itself may not contain any outlet structures. Instead, water may be pumped out for irrigation, for example, from part of the reservoir. Some sites are best suited to particular types of dams. An arch dam is most appropriate for construction in a high, narrow gorge where the arch of the structural shape provides strength. But an arch can also be built across a wider canyon where other effects like friction on the base of the dam add strength and resistance to movement. Similarly, a gravity dam is the typical choice for a shallow, wide canyon, but if it is built with some curvature, arching action will also strengthen a gravity dam in a narrower and higher gorge. Where the riverbed is exceptionally wide, the dam may be designed to have several spans, each with different engineering properties depending on the variation of foundation materials. The separate spans are usually supported on the downstream (air) side by buttresses or the extended curves of multiple arches. Sometimes, the spans of multiple span dams are constructed of concrete slabs or steel plates supported on piers. Like fill dams, concrete dams go through extensive rounds of preliminary design and feasibility studies to choose and explore the site, to evaluate the quantity of water retained and its value (as a power source or source of supply) versus the cost of the project over the anticipated years of operation, to consider a wide range of other effects such as changes to the environment, and to choose a dam of the optimal size and configuration. Hundreds of factors enter into these studies, and the process is usually iterative. A design is chosen and tested against all these factors until it fails to satisfy one or more factors, and the next variation in design is chosen and studied until it fails—or passes. An example of a typical concrete arch gravity dam plan. of persons and property downstream demands perfection. Before construction can begin on any dam, the water in the streambed must be diverted or stopped from flowing through the site. As in the case of fill dams, a coffer-dam (a temporary structure to impound the water)must be built or the water must be diverted into another channel or area down-stream from the dam site. For large projects, this construction may be done several seasons before building of the dam begins. The flow of water is closed off at the very last moment. The foundation area for any concrete dam must be immaculate before the first concrete for the dam is placed. As for fill dams, this is a detailed process of excavating, cleaning, and repairing the rock throughout the foundation "footprint" and on both abutments (the sides of the canyon that form the ends of the dam). Sites immediately downstream of the dam for any powerplant, stilling basin, or other structure must also be prepared. At some sites, extensive work may be required. If the rock in the foundation or abutments is prone to fracturing because of the load imposed by the dam and its reservoir, earthquake activity, or the properties of the rock, it may be necessary to install extensive systems of rock bolts or anchor bolts that are grouted into the rock through potential fracture zones. On the abutments above the dam, systems of rock bolts and netting may be required to keep large rock fragments from falling onto the dam. Instruments to monitor groundwater levels, joint movement, potential seepage, slope movements, and seismic activity are installed beginning during the early stages of foundation preparation through completion of the dam. A cutoff wall may be excavated deep into rock or holes may be drilled in the foundation for the installation of reinforcing steel, called rebars, that extend up into the dam and will be tied to the steel inside the first lifts of the dam. The idea is to build a reservoir that, like a bowl, is equally sound around its perimeter. The water is deepest and heaviest at the dam (when the reservoir is near capacity) so the dam and its foundation cannot be a weak point in that perimeter. Forms made of wood or steel are constructed along the edges of each section of the dam. Rebar is placed inside the forms and tied to any adjacent rebar that was previously installed. The concrete is then poured or pumped in. The height of each lift of concrete is typically only 5-10 ft (1.5-3 m) and the length and width of each dam section to be poured as a unit is only about 50 ft (15 m). Construction continues in this way as the dam is raised section by section and lift by lift. 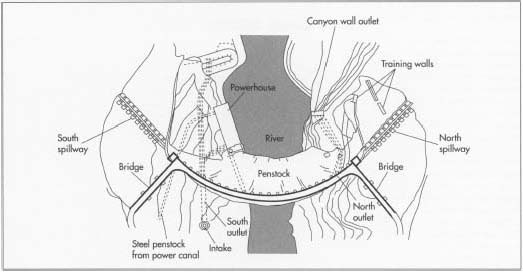 Some major dams are built in sections called blocks with keys or inter-locks that link adjacent blocks as well as structural steel connections. The process is much like constructing a building except that the dam has far less internal space; surprisingly, however, major concrete dams have observation galleries at various levels so the condition of the inside of the dam can be observed for seepage and movement. Inlet and outlet tunnels or other structures also pass through concrete dams, making them very different from fill dams that have as few structures penetrating the mass of the dam as possible. As soon as a significant portion of the dam is built, the process of filling the reservoir may begin. This is done in a highly controlled manner to evaluate the stresses on the dam and observe its early performance. A temporary emergency spillway is constructed if dam building takes more than one construction season; lengthy construction is usually done in phases called stages, but each stage is fully complete in itself and is an operational dam. The upstream cofferdam may be left in place as a temporary precaution, but it is not usually designed to hold more than minimal stream flows and rainfall and will be dismantled as soon as practical. Depending on design, some dams are not filled until construction is essentially complete. The other structures that make the dam operational are added as soon as the elevation of the their location is reached as the dam rises. The final components are erosion protection on the upstream (water) side of the dam (and sometimes downstream at the bases of outlet structures), instruments along the crest (top) of the dam, and roads, side-walks, streetlights, and retaining walls. A major dam like Hoover Dam has a full-fledged roadway along its crest; small dams will have maintenance roads that allow single-file access of vehicles only. Cross section of a typical concrete arch gravity dam. The height is 280 ft (85 m). The thickness grows from 16 ft (4.9 m) at the top to 184 ft (56 m) at the base. Away from the dam itself, the powerhouse, instrument buildings, and even homes for resident operators of the dam are also finished. Initial tests of all the facilities of the dam are performed. The final details of constructions are wrapped up as the dam is put into service. The beginning of the dam's working life was also carefully scheduled as a design item, so that water is available in the reservoir as soon as the supply system is ready to pump and pipe it downstream, for example. A program of operations, routine maintenance, rehabilitation, safety checks, instrument monitoring, and detailed observation will continue and is mandated by law as long as the dam exists. There is no dam construction without intensive quality control. The process of building alone involves heavy equipment and dangerous conditions for construction workers as well as the public. The population living downstream of the dam has to be protected over the structure itself; the professionals who design and construct these projects are absolutely committed to safety, and they are monitored by local, state, and federal agencies like Divisions of Dam Safety, the U.S. Corps of Engineers, and the Department of Reclamation. There are no byproducts in dam design or construction although a number of other associated or support facilities may be needed to make the project work. Waste is also minimal because materials are too expensive for waste to be allowed. Also, locations are often remote, and the process of hauling waste away from the site and disposing it is prohibitive. Soil and rock that may be excavated from the foundation area, down-stream sites, the abutments, or portions of the reservoir are usually used elsewhere on the project site. Quantities of materials cut away or placed as fill are carefully calculated to balance. The future of concrete dams is the subject of much debate. Each year, over 100,000 lives are lost in floods, and flood control is a major reason for building dams, as well as protecting estuaries against flooding tides and improving navigation. Lives are also benefited by dams because they provide water supplies for irrigating fields and for drinking water, and hydroelectric power is a non-polluting source of electricity. Reservoirs are also enjoyed for recreation, tourism, and fisheries. However, dams are also damaging to the environment. They can change ecosystems, drown forests and wildlife (including endangered species), change water quality and sedimentation patterns, cause loss of agricultural lands and fertile soil, regulate river flows, spread disease (by creating large reservoirs that are home to disease-bearing insects), and perhaps even affect climate. There are also adverse social effects because human populations are displaced and not satisfactorily resettled. For years before the start of construction in 1994 of the Three Gorges Dam in China, environmentalists the world over organized protests to try to stop this huge project. They have not succeeded, but controversy over this project is representative of the arguments all proposed dams will face in the future. The balance between meeting human needs for water, power, and flood control and protecting the environment from human eradication or encroachment must be carefully weighed. Bureau of Reclamation, U.S. Department of the Interior. Design of Sam ll Dams. Washington, DC: U.S. Government Printing Office, 1977. Jansen, Robert B. Dams and Public Safety. Washington, DC: U.S. Dept. of the Interior, Water and Power Resources Service, 1980. Krynine, Dimitri P. and William L. Judd. Principles of Engineering Geology and Geotechnics. New York: McGraw-Hill Book Co., Inc., 1957. Smith, Norman. A History of Dams. Secaucus, New Jersey: The Citadel Press, 1972. Bequette, France. "Large Dams." UNESCO Courier (March 1997): 44. Cotrim, John, et al. "Itaipu: South America's Power Play. "Civil Engineering (December 1984): 40. Fillon, Mike. "Taming the Yangtze: lauded and lambasted, China's Three Gorges Dam may be the biggest civil-engineering project ever." Popular Mechanics (July 1996): 52. Moraes, Julival de, et al. "Itaipu: Part 1." [Itaipu Hydroelectric Project, Brazil/Panama] Construction News Magazine (March 1982): 18. Moraes, Julival de, et al. "Itaipu: Part 2." Construction News Magazine (April 1982): 22. "Power-poor nation taps jungle river for energy." [Concrete gravity arch dam, Paute River, Ecuador] Engineering News Record (December 13, 1979): 26.
i need this article for a case study about small dams used for irrigation. Are there dam rebuilding companies for medium size projects in the NYS area that can be recommended?